Lefty Taylor Phillips offered me a quick reply to questions. He ended his letter, “Thanks for thinking of me. God bless.” He even added a favorite Bible verse (Romans 12:13). What surprised me most is that he used the F-word. I keep asking players about career highlights. Retired players are used to “my biggest thrill” questions. I want to hear about the most fun they had that year. I haven’t had any takers on the question until Mr. Phillips. Tomorrow: New York Met Bud Harrelson tells how Casey Stengel made a difference in his career. 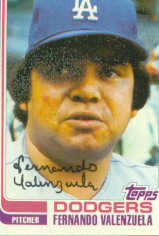 Fernando Valenzuela on Disabled List, Due to Autograph-Seeking Fan? Could Have Been! Wait. Here’s the whole story. My wife is on the field at Dodger Stadium shooting photos in 1988. She is exclusive witness to baseball history, a “could have been” spin on the 1988 World Series title for Los Angeles. Fernando Valenzuela emerged from the dugout. He grinned sheepishly as children chorused his name. Slowly, he turned, whipping the young fans into a frenzy. Slowly, he took a program to autograph. Suddenly, someone shouted. Valenzuela tried to identify the voice as he stared into the sun. All he saw was an underhanded baseball hitting him in the face. Coach Joe Amalfitano witnessed the mishap. He started shouting and scolding. The embarrassed pitcher held the offending baseball. The throng sucked in its collective breath. All Valenzuela did was smile, sign the ball and roll it back across the dugout roof. No disabled list time. No pitcher who swore off autographs. But a lesson. Will you be the one who changes hobby history? Thanks to one Diana Helmer, for sharing this classic tale. Someone who likes baseball, the hobby and ME? I feel like a World Series winner, too! Scour the blog comments here. One person brings up a good point. In-person collecting isn’t the same as through the mail. I haven’t tried the “graphing” in person game for more than 20 years. Why? Because I remember Bobby Randall. 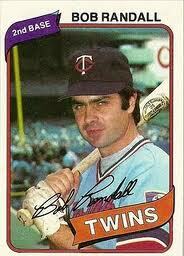 I had gotten him at the Kansas City hotel where the Twins stayed in the late 1970s. I remember him pointing, snorting and shaking his head at us collectors in the lobby. He muttered something to a couple of teammates. Fast forward to Iowa State University. The retired second sacker was the college’s baseball coach. I interviewed him for the ISU paper. After I was done talking about his career, I confessed that I had coaxed him to sign in my youth. “Did you like collecting autographs?” he asked with a grave expression. I replied with enthusiasm. That’s when I asked the hardest question. The ex-Twin’s face at Iowa State matched his frustrated glare in that KC hotel lobby. Randall remains a great by-mail signer. Back then, he volunteered to go give a talk to summer day-camp kids when my counselor wife asked. He talked with every single camper, signing for each after individual chats. How does it feel to sign autographs for a group of fans? How can collectors collect better? The answer might help refine your collecting game plan, as it shapes our hobby’s future. 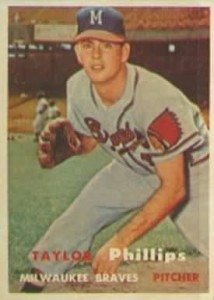 How Does A Rookie Catcher Handle Knuckleballers Phil Niekro & Hoyt Wilhelm? Very Carefully, Says Bob Didier! As a Little Leaguer, I couldn’t have caught a knuckleball with a butterfly net. That’s why I marvel at Bob Didier. He was named to the Topps All-Rookie team in 1969. That year, the Braves catcher broke in catcher two future Hall of Famers, knuckleballers Phil Niekro and Hoyt Wilhelm. “Niekro was the starter and he threw his knuckelballs harder and it broker sharper. Wilhelm threw his knuckleball softer but would have 2 or 3 different breaks at different times. 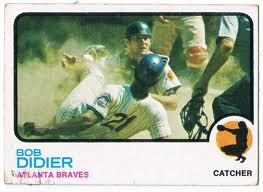 Didier’s 1973 Topps card is classic. The action shot is supreme. The 1972 Mets roster says #21 was Cleon Jones. Any details about the card? I asked about Didier’s father, super scout Mel Didier. “He signed Ralph Garr, Cecil Upshaw, George Stone, Andre Dawson and Gary Carter, among others. He taught me to respect the game. Didier shared a few tales with a Cape Cod League reporter in 2008. Read (and listen) here!